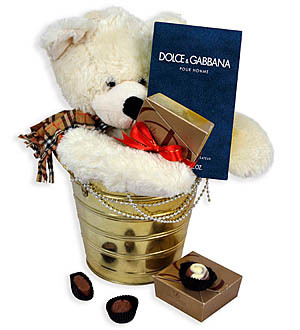 Send "love hugs" from Beary to your sweetheart. Comes with a bottle of dazzling Dolce & Gabbana Pour Homme EDT 75ml. Nothing is more seductive than giving a classic perfume that inspires the elegance and style of the Italian man by Domenico Dolce and Stefano Gabbana and a luscious box of Decadence Petit Praline to match.